Des Moines' Zombie Burger just dropped a steaming, connected, triple-burger masterpiece on the world. 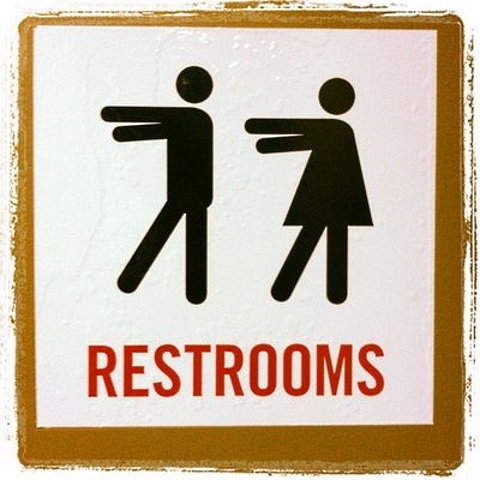 A Des Moines horror movie-themed burger bar called Zombie Burger is looking forward to the movies release. We can’t get over the insane level of thought that went into crafting this particular Zombie Burger of the Week: an homage to The Human Centipede 2. The protagonist of the second movie is a guy named Martin, a disturbed loner who is completely obsessed with the original Human Centipede film. So Martin decides he’s going to up the stakes and create a bigger centipede than the first film, and goes to work. Seriously, just read the description below. 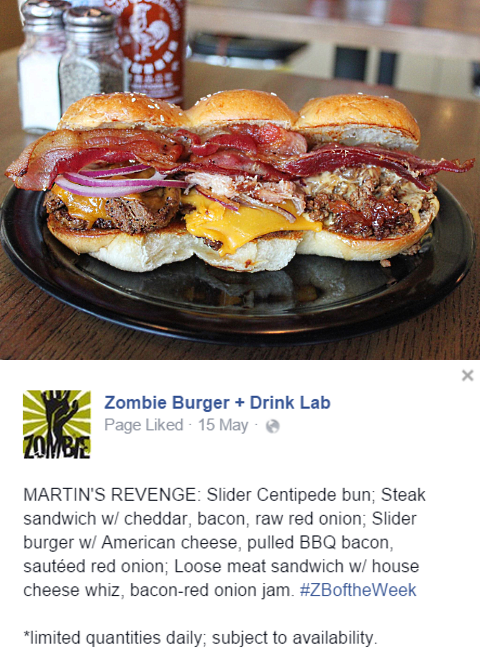 This isn’t the first Human Centipede-inspired menu item Zombie Burger has introduced. In fact, one appetizer that you can order all the time is Dr. Heiter’s Poutine Basket (Dr. Heiter is the protagonist of the first part of the trilogy). The menu says it includes “cheese fries, chili fries and poutine fries” and is “100% medically accurate”—a nod to the film’s tagline. Chef Tom McKern and owners George Formaro and Paul Rottenberg clearly take their dedication to all things horror seriously. Even horror fans might not necessarily want to think about food while watching The Human Centipede, but Chef McKern was game to tackle the task. “I was trying to figure out a way to do a take on the movie through a burger. I basically started with whole ingredients, and processed them down from slider to slider. “Martin’s Revenge” will run you $10.79, and will be available through May 21st. If the idea of eating a Human Centipede burger doesn’t appeal to you, perhaps The Walking Ched or They’re Coming To Get You Barbara (complete with two grilled cheese sandwiches for buns) might whet your appetite. Vegetarian horror fans (which you might be after watching The Human Centipede, even if you were a proud carnivore before) can feast on the Nilbog, a house-made veggie nut patty and nod to the infamous best worst movie ever, Troll 2.